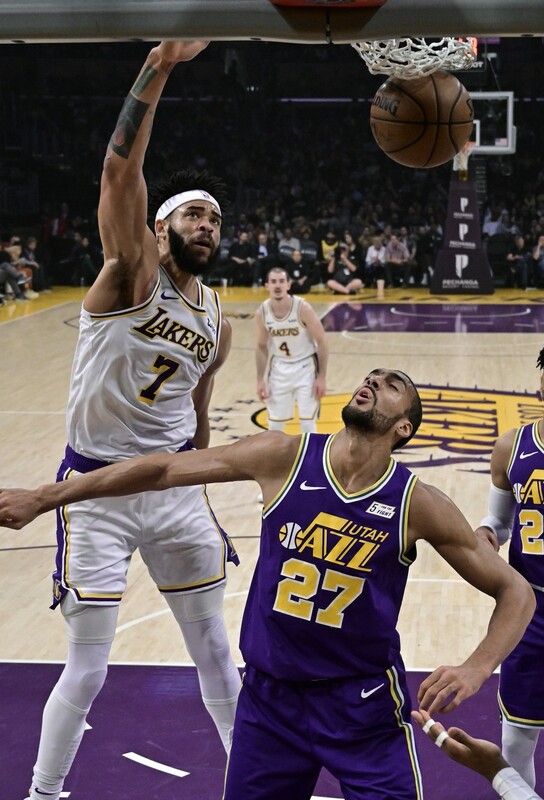 Even without many recognisable names on the roster, the Los Angeles Lakers still find ways to win games as Kentavious Caldwell-Pope took over late in Sunday's 113-109 win over the Utah Jazz, the second straight win over a playoff-bound opponent. The guard scored 18 of his 32 points in the fourth quarter, plus an assist on the game-sealing basket by JaVale McGee. Alex Caruso added 18 points and 11 assists at the Staples Center to help the Lakers improve to 37-44 with one game remaining. The Jazz saw their seven-game win streak come to an end despite 19 points from Donovan Mitchell, but the 49-31 squad is still in good shape to nab the No. 5 seed in the Western Conference. With LeBron James and all of the notable young players unavailable, Caruso has taken on a bigger role and run with it. He showcased his skill set against one of the best defenses in the NBA on Sunday night, finishing with 18 points and 11 assists. This comes after totaling 32 points, 10 rebounds and five assists in Friday's win over the Los Angeles Clippers. Caruso has shown that he could be a reliable player on the court. His playmaking was especially notable against the Jazz, setting a new career high in assists while showcasing impressive vision. Meanwhile, he consistently got to the rim and scored without having his best shooting day. Lakers will close the regular season against another team headed to the playoffs when it hosts the Portland Trail Blazers on Tuesday. Utah will face the Denver Nuggets on Tuesday in the team's last home game of the year.